Modern garden design means envisioning and creating a personalized outdoor living space that reconnects the homeowner to the natural world. Humanity's unique bond with nature has been weakened by the growth of densely populated urban centers. Now, there is a movement in modern landscape design to reconnect us to our primal roots by creating outdoor living spaces that celebrate the natural world while serving as statements of personal style. This means that a modern garden is not simply a place to showcase plants; it is an artistic outlet, a healing sanctuary, and an extension of the home. 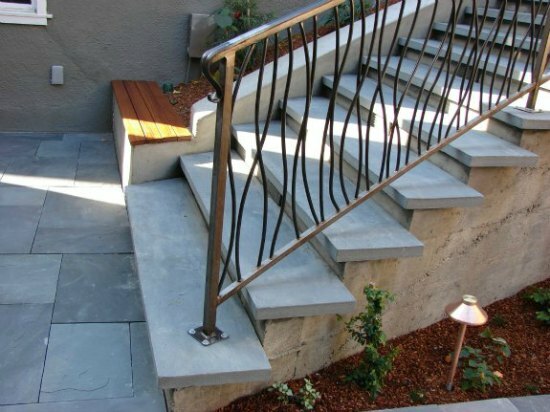 Modern landscape design means breaking-free of the constricting rules of the past to embrace a self-created future. 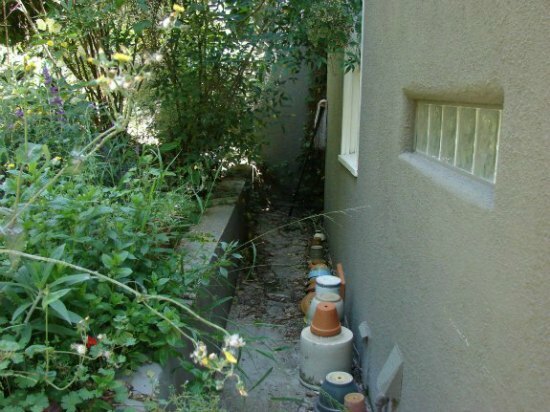 However, this can leave one with an overabundance of choices when trying to decide on a combination of plants, furnishings, and hardscape walks and walls. 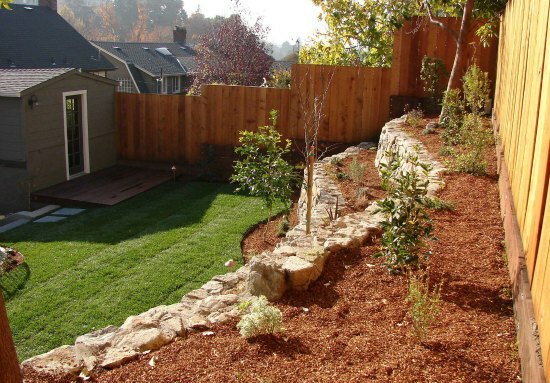 This is where co-creating with an experienced landscape designer comes into play. 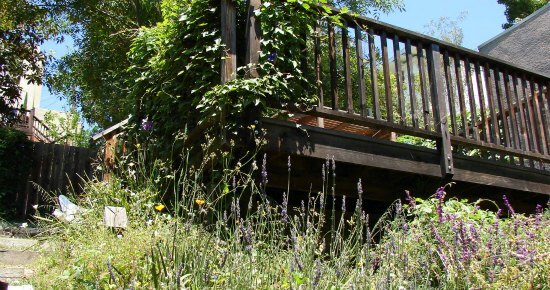 Located in the Lakeshore area of Oakland, this overgrown and prohibitively steep back yard was transformed into a multifunctional refuge of tranquility. Modeling the homeowners' urban eclectic style, we created a space that combined their green aesthetic with a desire to pay homage to the urbanity of the City. 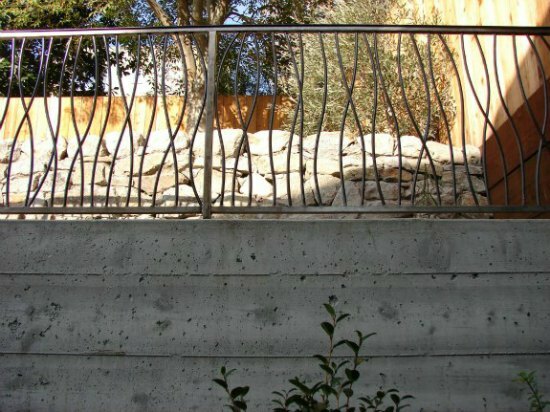 Urban eclectic blends urban materials such as concrete, wire panels, and metal with more natural materials, such as stone, wood and native plants. 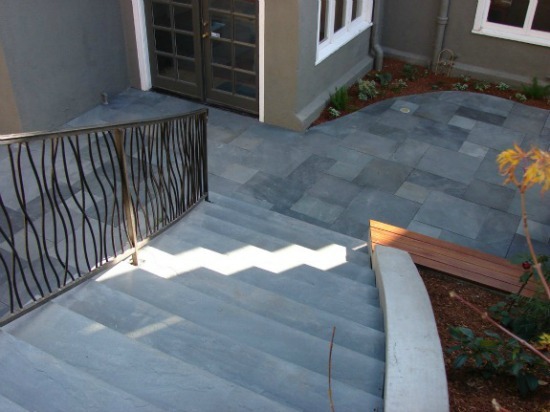 Dividing the project into three levels, we first built a Connecticut Bluestone patio. Upon the patio rests a hot tub and day bed. 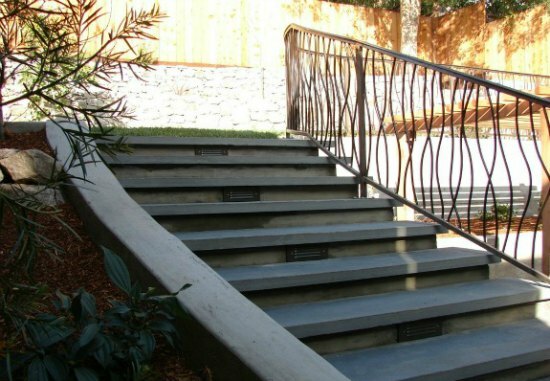 From there, a curved staircase with custom metal railing was installed featuring pickets mimicking tall grasses swaying in the wind. 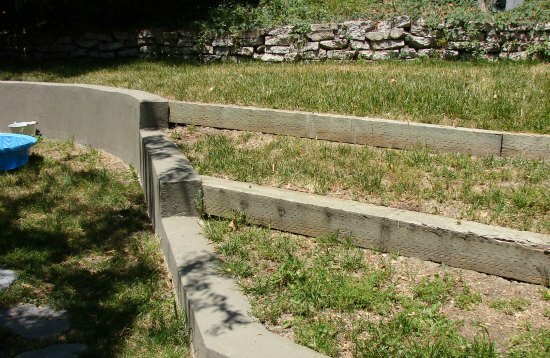 This design gracefully unifies the first level with the lawn and office level. Next, we designed the middle terrace to compliment a swath of verdant lawn; perfect for children’s play. 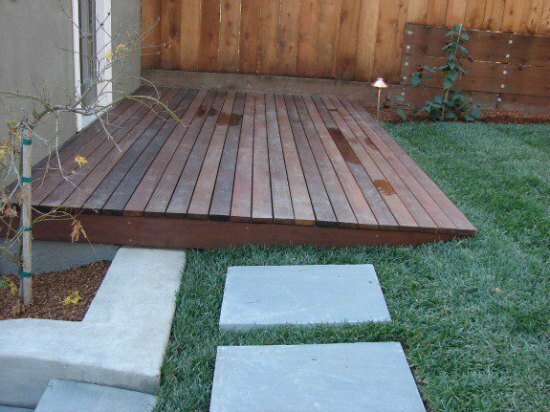 Lastly, we constructed a deck off of the office which was made of Ipe wood - a Brazilian, long-lasting renewable hardwood. 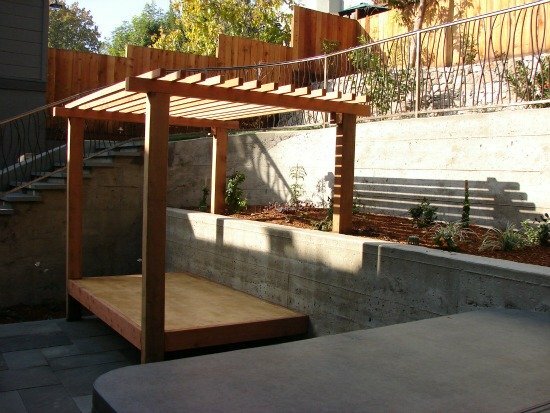 This deck connects the middle level with the top level, creating a cozy niche for lounging and viewing the downtown skyline. 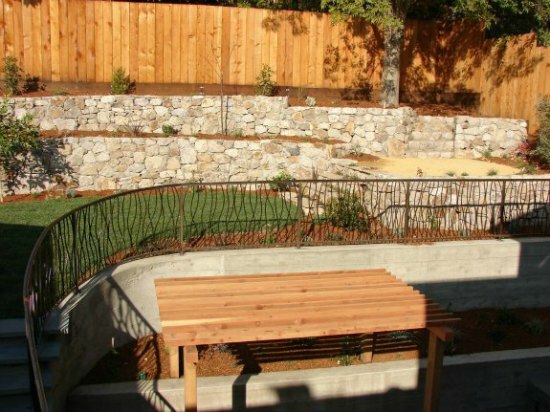 This modern garden design is merely one possible personalized vision of a private oasis. 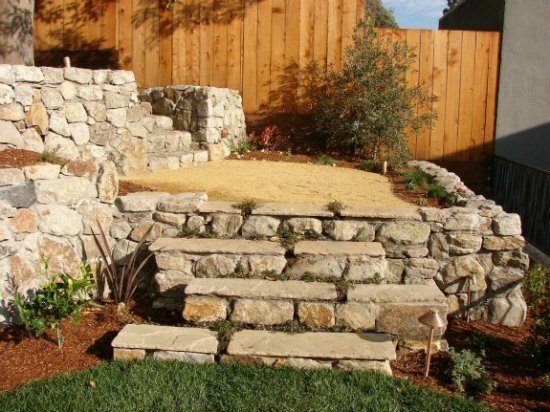 Let Sarah Ray Landscape Design help you realize your desire for the perfect outdoor living space.